View to the Mountains from our AirBnB...jealous much?! Amy K is back with our latest blog...Thursday's theme is City and Town Travel! Vancouver is a diverse, vibrant, international city in Canada. The city is a great stepping off point for a number of adventures, including skiing on Grouse Mountain, hiking in forests, kayaking, traversing across suspension bridges. 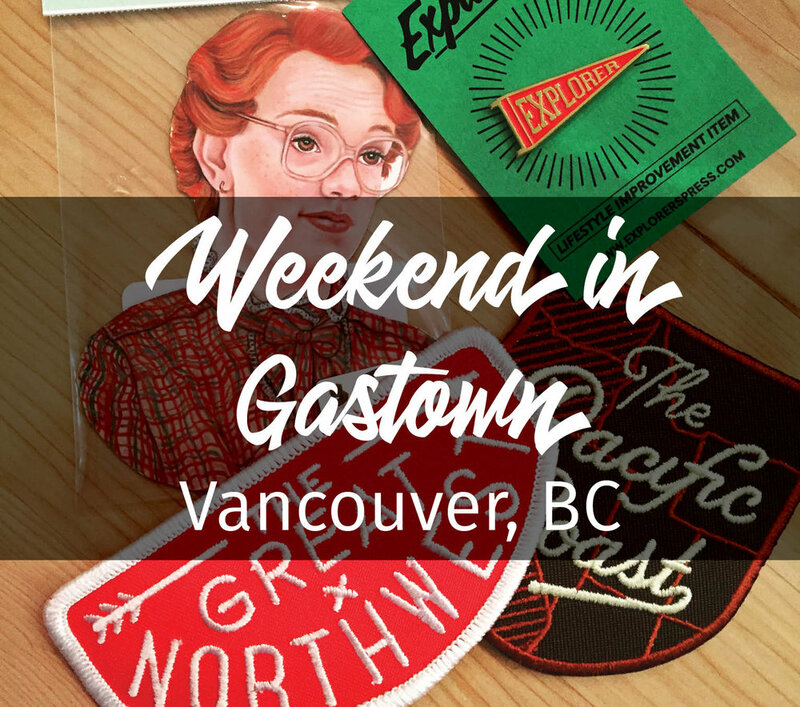 While I was there in March, it was pretty chilly and rainy, so my friend Stacey and I opted to mostly stay in the city….specifically, Gastown and spend a lot of our days shopping, drinking and eating our way through the area! • Ask for Luigi: Like Italian food? Don’t like Italian food? Doesn’t matter. You HAVE to go to Ask for Luigi. It’s a teeny tiny little Italian restaurant that is mind-blowing. Order a few items and share…that’s what it’s based around. You can’t make a reservation, so go and put in your name. Then venture to the Alibi Room (below) for a drink. • Tacofino: For some cheap eats, check out Tacofino, located in the ubiquitously named Blood Alley. The have tons of options, including vegetarian and vegan. • L’Abattoir: Great spot for a fancy brunch, including mimosas, bloody marys and even bottles of prosecco for a great price. Try the currant scone at the beginning of the meal! • Alibi Room: If you like craft beer, come here. They have great local beer on tap and really good small plates. They even have brunch. • Juniper: Full disclosure: this is more of a dinner spot, but we had pre-dinner cocktails here each night. Try the Negroni on tap or (my favorite) the Manhattan! They also have a comprehensive wine and beer list. Juniper has a great bar for people-watching as well as bartender watching. • Six Acres: Located in front of the Gassy Jack Statue, this is a great place for drinks….they even have happy hour from 11:30-6! It’s a cozy, brick building with outdoor seating when the weather is good. They have a very large list of beers, wine, and cocktails. • Nettle’s Tale Swimwear: Although this adorable shop is more centered on swimwear created by the owner, they also carry dresses, tops, jackets, home goods, and accessories. We stumbled upon the store the day they opened and spoke with the owner about her vision of Swimwear for All. • Community Thrift: Trying to find the perfect pair of hipster jeans or a vintage tee? Community Thrift is your store. We didn’t buy any clothes, but who can pass up a Barb magnet? • Old Faithful Shop: If dining wear is more your thing, check out Old Faithful. They have cutting boards, marble platters, aprons, and cookware galore. If anything, just check it out for the gorgeous layout and fixtures. Where are your favorite spots to hit up in Gastown? We'll be back tomorrow with Mike R's Adventure Destinations post with a hike you want to get on your calendar!